This is long, but when you start talking about what Willie Nelson did in 2007, it takes some space. Willie Nelson had another amazingly busy year, with their never-ending tour, recording, and offering his time, money and vision to causes important to him. 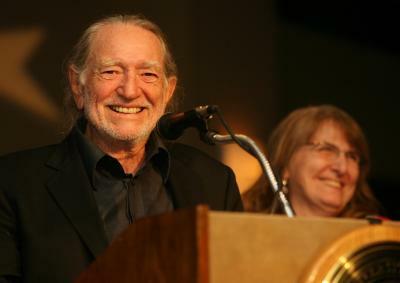 Willie received honors in several areas this year: for his music, his songwriting, his work for peace, his commitment to peaceful, conflict resolution, for his environmental activism, and an ice cream was named after him, with the proceeds going to benefit Farm Aid. Who else does that? This is a far-from-complete list of what Willie accomplished this year, but shows you some ways he spent his time. And any mistakes included are mine alone, and I welcome any corrections anyone might have. On January 12th and 13th, Willie Nelson joined the Wynton Marsalis Quintet for four sold-out shows in NYC, organized by Jazz at Lincoln Center. The show, billed as ˜Willie Nelson Sings the Blues, was broadcast on the radio, and you can hear the entire concert at Wynton Marsalisâ’s website, www.wyntonmarsalis.org. friend sent me a copy, and its beautiful; they are all such amazingly talented artists. Really, Willie could have a successful career singing rhythm and blues, exclusively. On March 20th, Willie Nelson, Ray Price and Merle Haggard released a 2cd set of newly recorded music. It is a collection of country classics, and a couple new ones. It was produced by Fred Foster, on Lost Highway Records. Then, if the album was not incredible enough, these three hall-of-famers did a tour in support of their album. I hope we haven’t seen the end of that tour. I got to see them twice, and Iâ€™d like to see them again. Willie Nelson was invited to perform at a free concert in Choteau, Montana on July 3rd. The concert was a gift from David Letterman, who wishes to remain anonymous, to the town of Choteau.Â Only residents of Choteau, and Teton County, were invited to attend, and the demand for tickets, and invasion of country music fans really had the town buzzing. I had someone offer to buy mine for $500, when I was leaving my motel, and others at the show who had paid a lot for theirs. It was a wonderful concert. Willie Nelson and Family performed at the Gorge Amphitheater in George, Washington on the 4th of July, along with some alt country rockers: Son Volt, Old 97â’s, Drive-By Truckers and Amos Lee. Austin Freedom Fest (August 8th): Willie performed along with Asleep at the Wheel, Paula Nelson, Folk Uke and others at the Back Yard in Austin, at a benefit for NORML, the Marijuana Policy Project and WAMM, a Santa Cruz, CA hospice for medical marijuana patients. I got to go, and Willie and Bee Spears set in for a lively set with Folk Uke, with Bee on his stand up bass. Paula Nelson singing a moving version of Jackson, and I remember thinking, Is she having as much fun as she looks like she’s having? Funny thing, though, itÂseemed like there was no more pot smoking going on at the Freedom Fest, than at any of Willie’s shows. Maybe that was just where I was sitting. Farm Aid 2007: HomeGrown Festival, on Randall’s Island, NYC, September 9th, with Neil Young, Dave Matthews, John Mellencamp and a cast of thousands. On September 10th, Willie andÂ some family stayed an extra day in NYC, and performed at the Hard Rock Cafe Ambassadors of Rock Festival, with proceeds to benefit the Sustainable Biodiesel Alliance, co-founded by Annie Nelson. The festival was hosted by Woody Harrelson. Willie was honored with the BMI American Icon award on December 6, 2007, in Nashville.Â On hand were Kris Kristofferson, EmmyLou Harris, Jessica Simpson,Â Sheryl Crow, Nicole Kidman, Carrie Underwood, Vince Gill, andÂ Willieâ€™s families and friends, and fans.Â Â CMT.com reports that Nelsonâ€™s Maui neighbor Kristofferson gave perhaps the most heartwarming tribute before he and Emmylou brought the house down with a duet on â€œTil I Can Gain Control.â€Â Â I hope somebody filmed that night, and I get to watch it sometime. Willie was honored on 10/19/07 with the â€˜Bridging Dividesâ€™ award, for his visionary aid to peaceful conflict resolution, at the Frank Erwin Center on the University of Texas campus. His children (except Lukas, away at school, I think) all sang â€˜Peaceful Solutionâ€™ to their father, the song inspired and written by Willie and daughter Amy. Ben and Jerryâ€™s named a new flavor in honor of Willie: Willie Nelsonâ€™s Country Peach Cobbler, and are donating a portion of profits to Farm Aid.Â Willie appeared on the Stephen Colbert Report, for a taste test of his flavor against Colbertâ€™s Americone Dream flavor.Â Ambassador Richardson was called in to mediate, and then everyone joined Willie for a lively â€˜On the Road Again.â€™Â The show is available for sale, on Best of the Colbert Report DVD. Â Â Â The Willie Nelson PeaceÂ Research Institute launched in April 2007, as a portalÂ of inspirationÂ for living peacefully in the world. The site has links and informationÂ about how others are finding ways to live in peace, and actions they are taking to end war in the world.Â Also,Â through the site, Willie and Amy Nelson offered the song they wrote, â€˜A Peaceful Solution,â€™ to any person to record and share at the site, and have posted the video tapes and recordings at the site for everyone to enjoy.